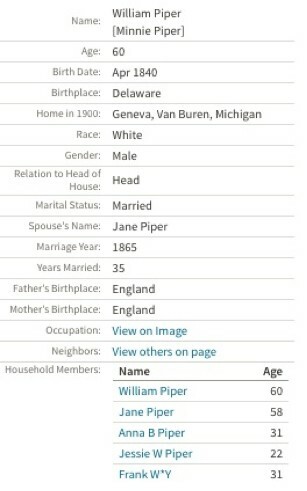 My interest for the Piper family comes through John R Long who married Sarah Ann Piper about 1842. For the moment, I only know that John R was born (about 1815) in Pennsylvania, so was his father. Since I had very few information about Sarah Ann, I decided to search the Web, hoping to learn more about her family. Sarah Ann first appeared in the 1850 Census in Gaines, Orleans New York. She was 27 years old, married to John R. The couple had three children: George Jackson, William and Sybilla (known as Belle). 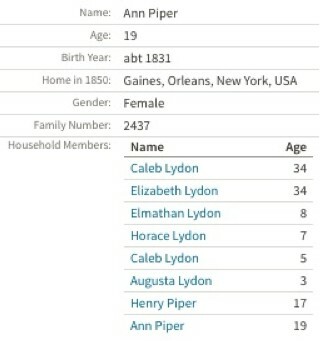 It seems that she was also the guardian of her siblings: Ann, William and Henry J. From this census and others, I knew that she was born in England (and not in Delaware), so was Ann. William and Henry J, though, were born in Delaware USA. That was enough to give a direction to my search. 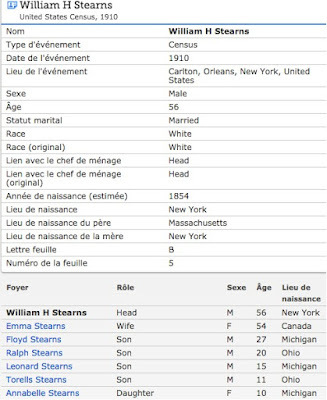 In family trees, I found that Henry J has been well documented, which is not the case for Ann and William. 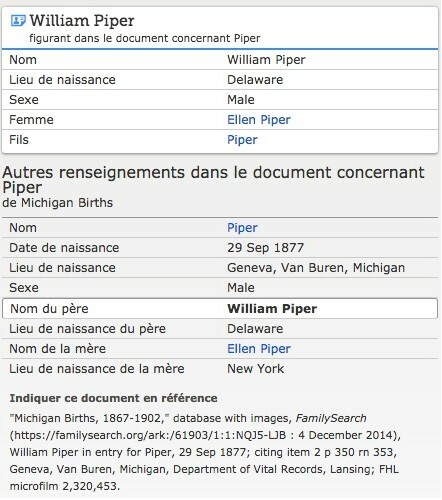 Many of my documents will be helpful for those who are looking to complete their family tree about the Piper family. Kingsclere & Woodcott are 10 miles apart. The following screenshot has been, simultaneously, a satisfying and frustration piece of information. 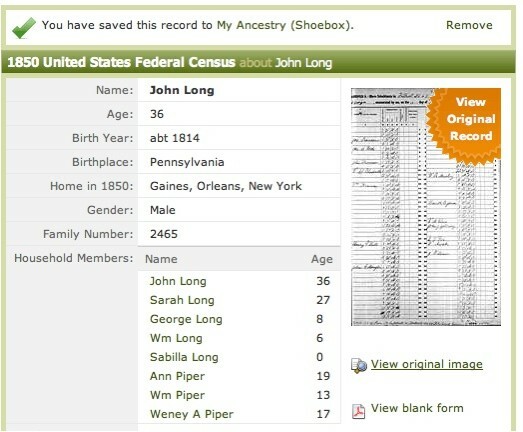 It reveals, for the first time, everything about the family of John R. Long and Sarah Ann Piper. 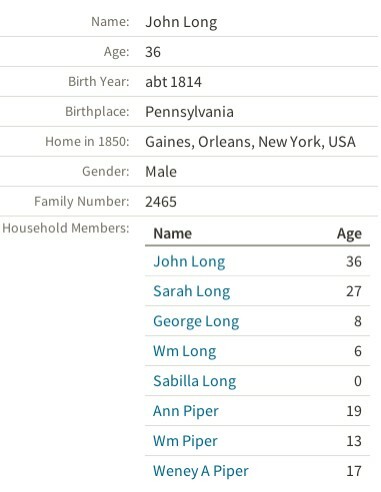 John R. is the ancestor of Darl Long originally from Michigan USA. Darl is closely related (Y-DNA) to the Long (Lang) family of Madawaska NB Canada. This section, though, will be devoted to Sarah Ann Piper. All the researchers I know have been struggling to find information about her. In 1850, the family is living in Gaines Orleans New York. We know from another source that Sybilla was born February 16, 1850 in Erie Erie County Pa. It is estimated that her two older brothers, George Jackson & William were born in 1843 and 1847. In fact, George Jackson was born on January 30, 1843. For whatever reason, three siblings of Sarah Ann are part of her family in 1850 in New York. NB. 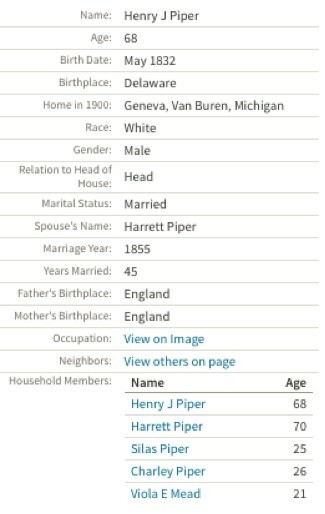 Weney A Piper is rather Henry J Piper in the 1850 Census. 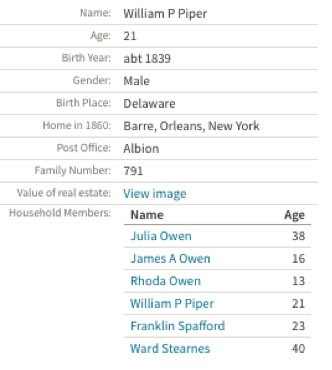 We learned in the 1850 Census that Sarah was born in Delaware. From a note left by Sybilla, her mother was rather born in England. 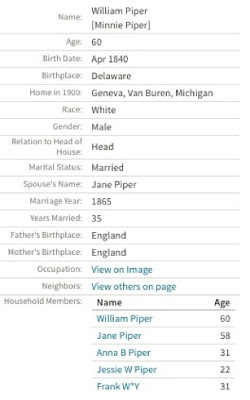 Nevertheless, if Ann was also born in England, William and Henry were born in Delaware. The family must have immigrated to America during the 1831-1832 period. William appeared in various documents. 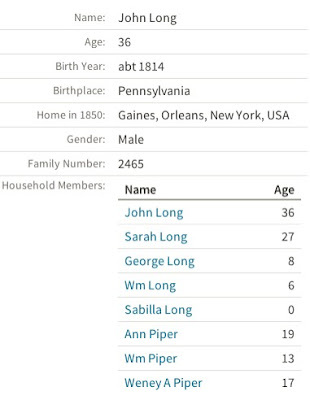 He is listed with the family of John R Long & Sarah Ann Piper in the 1850 Census in Gaines, Orleans NY. 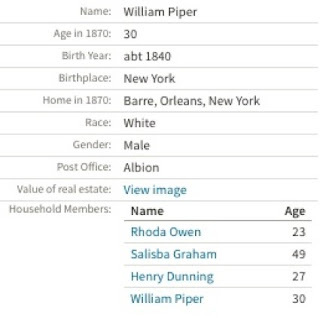 In the 1855 Census in Gaines New York, he is part of the family of his sister Ann Piper-Stearnes. From the same 1855 Census we learn that he was born in Delaware. 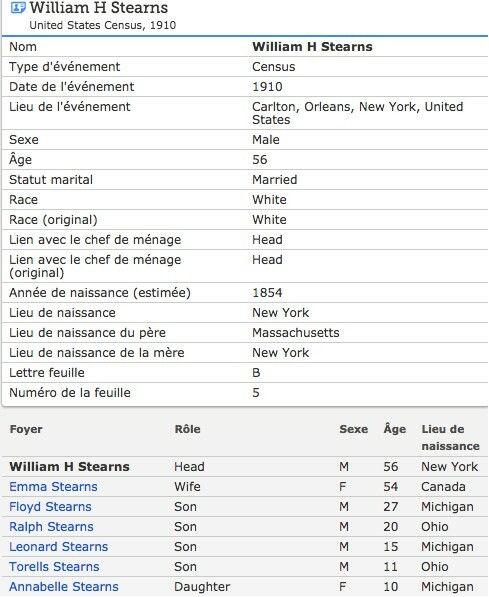 In 1860, William lives with his brother-in-law, Ward Stearns, in Barre NY. It seems that Ann also died young. No death certificate. Same event as the preceding but extracted from Family Search instead of Ancestry. In 1870, he still lives in Barre NY. 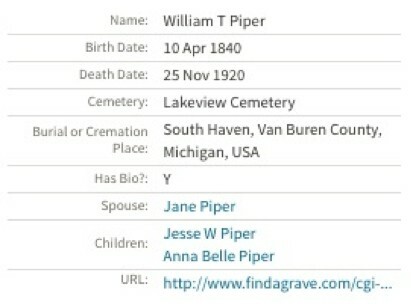 In 1880, he lives in Geneva MI and he is married to Phoebe Jane Tripp. 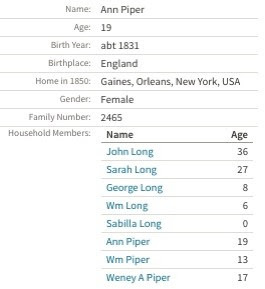 One of his children is called Anna Belle Long. We must remember that his halfsister (Sybilla) was called Belle. In 1900, he lives in Geneva MI and is 60 of age. Same event as the preceding screenshot but extracted from Family Search instead of Ancestry. 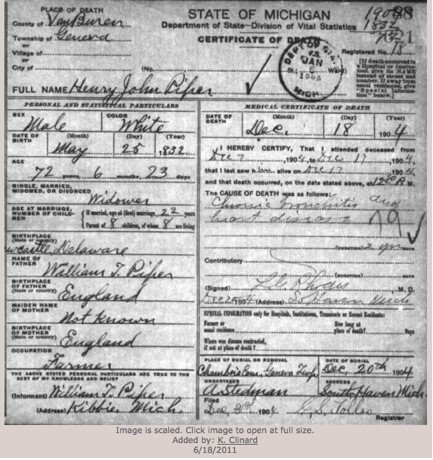 In 1910, William lives in Geneva MI. 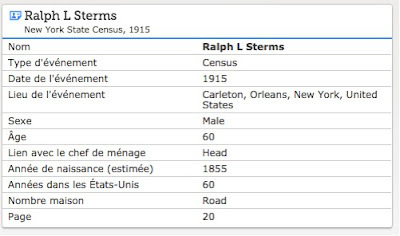 In 1920, at the time of the Census, he is alive. He died soon after during the same year. 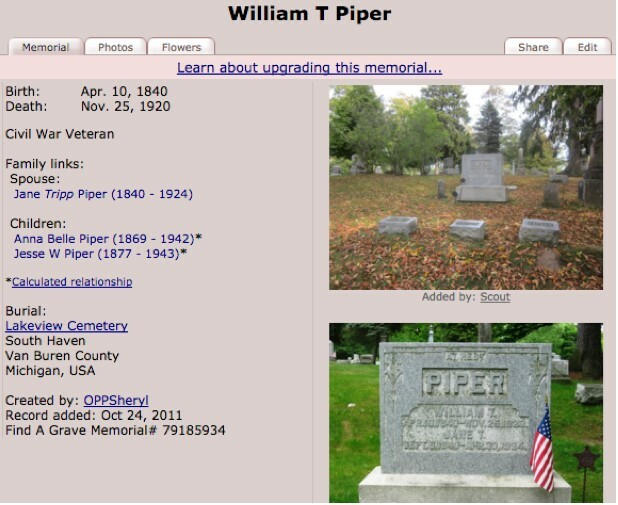 In 1920, William dies in MI. This document shows that William is a neighbor to his brother Henry J in Michigan. Also, between the two, there is Robert Tripp, the brother-in-law of William. 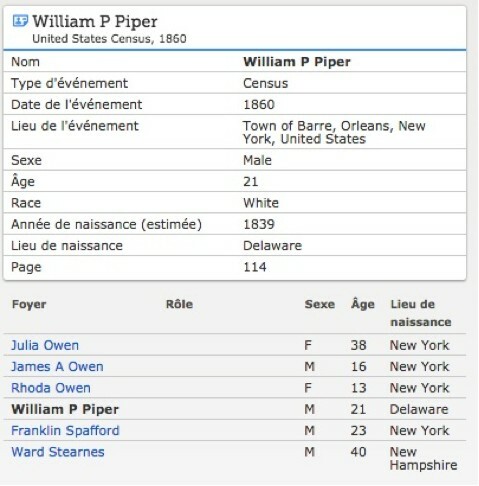 In the 1850 Census from Gaines NY, we learn that Henry J was born about 1833 in Delaware USA. In Newcastle Delaware was baptized on July 17, 1836 William Thomas. 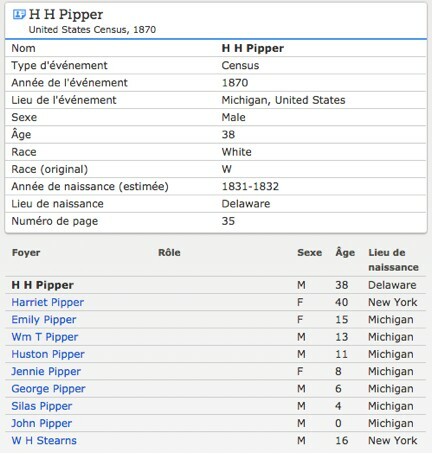 His parents were William Piper & Elizabeth. 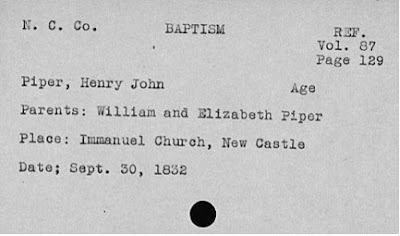 At the same church, Henry John was baptized on September 30, 1832. 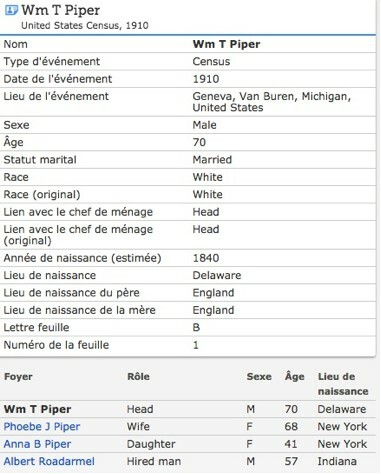 His parents were William & Elizabeth. 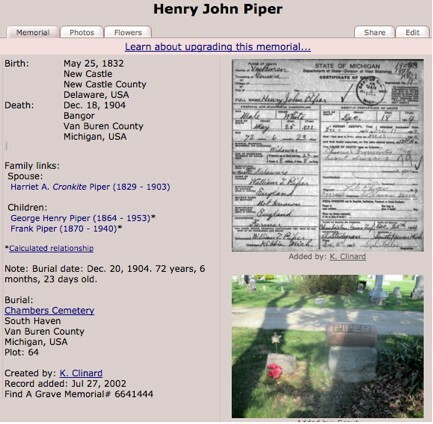 In family trees (Ancestry), Henry J is said to be born in May 1832, which could be right since he might have been baptized months after his birth. In the 1850 Census at Gaines NY, Henry J lives with the Lydon family. Ann Piper is also part of the family. In the same 1850 Census at Gaines, the siblings of Sarah Ann, including Henry J, are also present. It could simply mean that Ann & Henry J moved from the Long family to the Lydon family during the year. Sarah Ann could very well have died during that year. No certificate of death has ever been found. Henry J. is drafted for the Civil War on July 9, 1863. He is 33 years old. 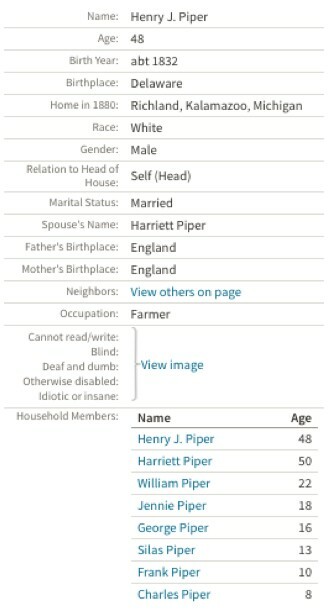 In the 1870 Census, after the Civil War, Henry J is married to Harriet and the couple has seven (7) children from 15 to 1 year old. Also, William H Stearnes lives with them. He’s 16 years old. 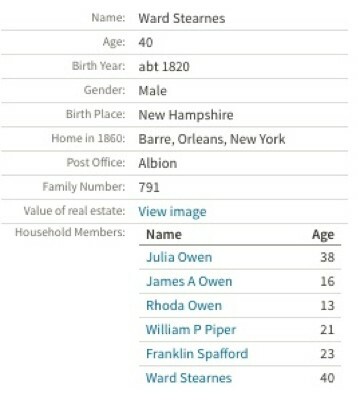 He is the son of Ann Piper and Ward Stearnes. 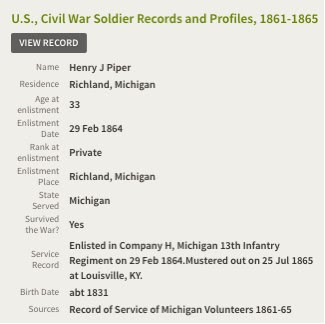 In the 1880 Census at Richland MI, we find the family of Henry F & Harriet. In the 1900 Census at Geneva Michigan, the family is considerably reduced. Henry J Long died on the December 18, 1904 in Geneva, Van Buren Michigan. 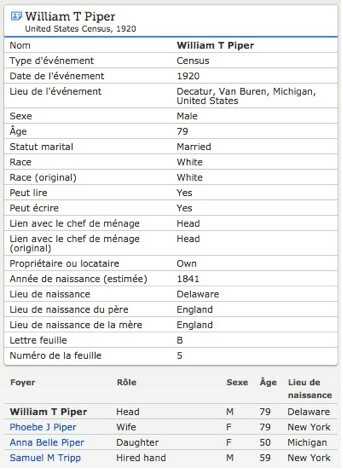 We also learn on the birth certificate that he was born in NewCastle Delaware, a very important piece of information. It matches the baptism cards that I have published at the beginning of this section. 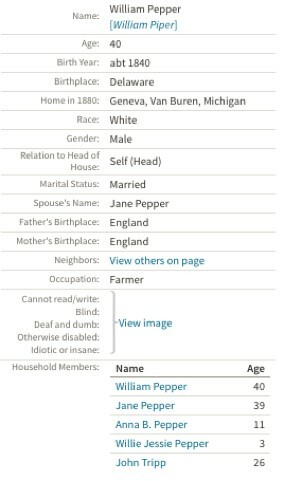 From the following screenshot of the 1850 Census, we learn that Ann was born about 1821. From another source, we know that she was born in England. 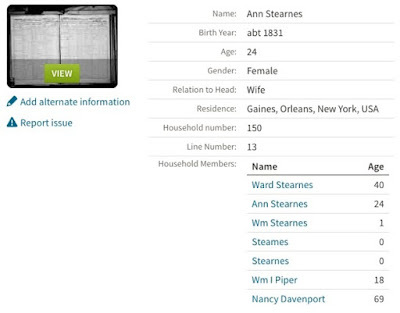 During the same 1850 Census in Gaines NY, Ann & Henry are listed with another family. These two individuals could be different from those living with John R Long. It is also possible that they moved from one family to the next in the same year. We know that Sarah Ann died not long after their arrival in New York. No certificate of her death has ever been found. Sarah could have died in 1850. From the 1855 Census taken in Gaines NY, we see that Ann is married and a mother of William Stearnes. Her husband is Ward Stearnes. In the 1860 Census in Gaines, it is obvious that Ward is a widower. His brother-in-law, William P Piper lives also with the Owen family. 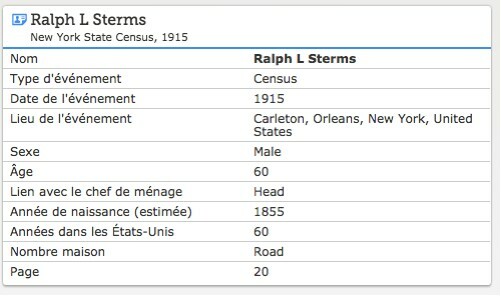 Same event: the 1860 Census in Barre NY. We see that Ward & William P. Piper are living in a house numbered 791. In the house numbered 788, there is the family of Sarah Jackman. This event is also from the 1860 Census. Three children live with her: a girl named Sarah L. Shafford, William Stearnes and Ralph Stearnes. It seems that Sarah Jackman had a child from a previous marriage and two others with Ward Stearnes. 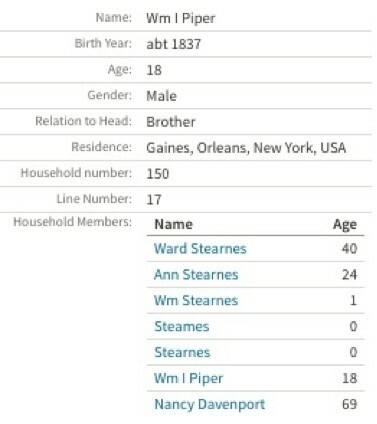 What makes more sense is that these two Stearnes children are from Ward & Ann Piper. 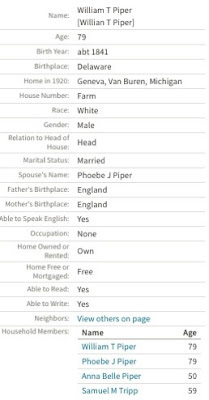 In the 1855 Census, Ward and Ann had three children, William and a pair of twins. Ralph is one of the twins. The other twin must have died because there is no trace of him. 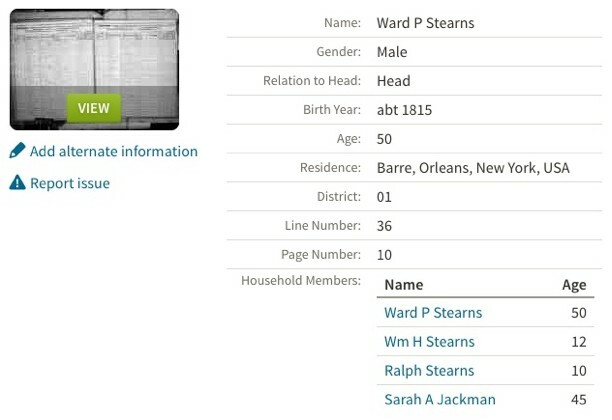 In the 1865 Census, Ward Stearnes lives with Sarah A Jackman and two children by the family name of Stearnes. It doesn’t take much imagination to realize what kind of relationship these two neighbors had since 1859. 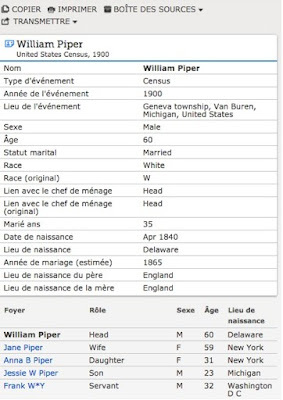 William T. Piper is not living anymore under the same roof as Ward. The following document is about the family of William H Stearns, the son of Ward Stearnes and Ann Piper. 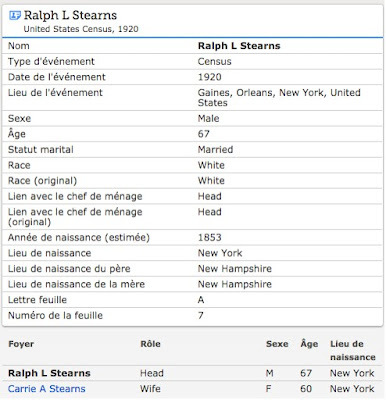 he following 1910 Census in Gaines NY is about the son of Ward Stearnes and Sarah A Jackman, Ralph L. Stearnes. 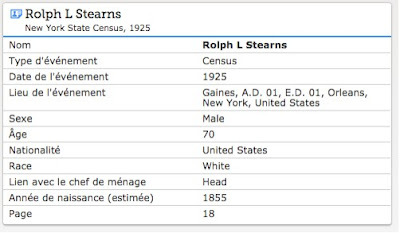 The following 1920 Census in Gaines NY is about the son of Ward Stearnes and Sarah A Jackman, Ralph L. Stearnes. 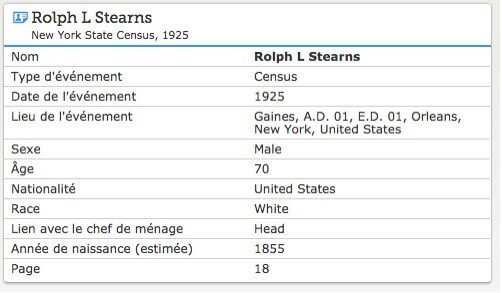 The following 1925 Census in Gaines NY is about the son of Ward Stearnes and Sarah A Jackman, Ralph L. Stearnes. The following document in Gaines NY is about the death of Ralph L. Stearnes, son of Ward Stearnes and Sarah A Jackman. 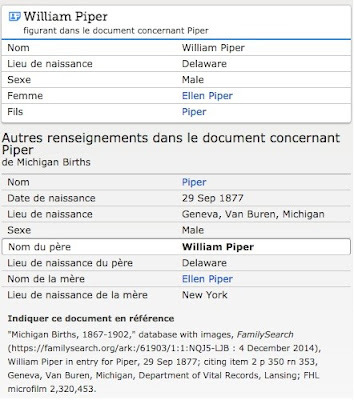 The following document is about William Piper, the son of William Stearns and Emma born in Geneva Michigan.